Joe Paterno receives a plaque celebrating his 409th career win on Oct. 29, 2011 at Beaver Stadium in State College, Pennsylvania. Photo by Justin K. Aller/Getty Images. Legendary Penn State football coach Joe Paterno, in the middle of his 46th season, announced Wednesday that he will retire in light of allegations of sexual abuse against former Penn State defensive coordinator Jerry Sandusky, who was arrested Saturday on 40 counts of child sexual abuse after a three-year grand jury investigation. Two other Penn State employees were also arrested on charges that they failed to report the abuse. Under growing pressure to resign in recent days for not reporting the alleged incidents to police, fans gathered at Paterno’s home in a show of support for “Joe Pa” Tuesday night. 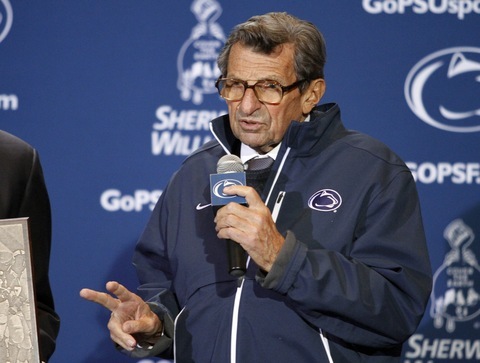 Paterno has worked as head coach since 1966. We’ll have more on the latest developments and the growing firestorm on Wednesday’s NewsHour.